Canada is a huge country next to Russia. Canada covers territory from the high Arctic to the northern border of the continental USA and from the Atlantic to the Pacific. 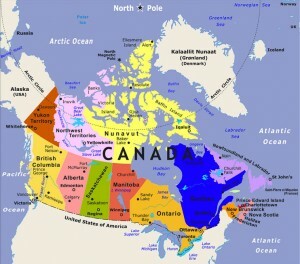 Although it is more than a northern country as the topography and geography of Canada is very varied. Canada is known for its untouched forests and snowy panorama, but there are also badlands and deserts, long and wide beaches as well as temperate forests. Canada’s winter is considered as one of the coldest season in the world. The country crosses North America from Newfoundland and the Atlantic Ocean towards Vancouver Island and the Pacific Ocean. Surrounded by mountains, great lakes, and prairies, its extent begets a topography and climate so varied that if it concerns the weather especially during winter, anything can occur. If you prefer to stay in Canada and you are looking for an area with a mild winter season then stay in the south, particularly near the Ocean. In some part of the country, people will have a hard time dealing with the weather and slippery roads for 6 months. Residents of this country have come to deal with this fate in various ways. Others might choose to hibernate with the bears or some would fly south with the birds, there are some who choose to stay and fight the weather. To make the weather a fun filled season they celebrate winter festivals, cross-country treks and others. So, don’t get affected by those sub-zero temperatures there are lots of things that you can have fun with in Canada during winter, and of course during summer. First stop, the Canadian Rockies. Straddling the Alberta/B.C. border, this group of mountains run from the U.S. border to the northern end of B.C.. Inside the Canadian Rockies are some of the most amazing, tranquil and also breathtaking attractions on the earth’s surface. These spectacular mountains are unique as compared to the American Rockies since they are usually covered by snow, which results in sharply pointed mountains divided by wide, valleys scoured by glaciers, while the American Rockies are more curved. Definitely on the top of the list of great attractions the Niagara Falls. Located on the Niagara River are 3 huge waterfalls at the southern tip of Ontario, on the border between the United States and Canada. The three falls are named as The American Falls, The Horseshoe Falls and the Bridal Veil Falls which is the smallest falls among the three. The Horseshoe Falls is also called as the Canadian Falls since it is located mostly in Canada. It is one of the natural wonders of the world. You will definitely not forget the sight as well as the thunderous sound of the flowing waters. These are only the two most popular attractions that you will surely enjoy and remembered. So, if you are planning to visit Canada make sure that you will include these amazing sights in your list. Your visit in Canada is not complete if you fail to visit Canadian Rockies and Niagara Falls. Actually, there are lots of other amazing attractions in Canada. Of course as this site is about Victoria and Vancouver Island, we highly recommend that you pay a visit. Check some information about Victoria or also Tofino.